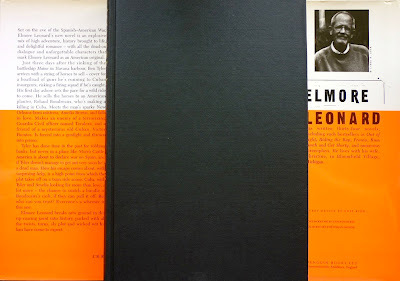 Cuba Libre, published in 1998 and seen here in its British Viking edition, which sports the same Chip Kidd-designed dust jacket as the American Delacorte edition. Set in Cuba in 1898 on the eve of the Spanish-American War and the accompanying Cuban struggle for independence, it follows former bank robber Ben Tyler and his friend Charlie Burke as they transport a string of horses to the island – said horses being but a cover for a shipment of guns intended for the Cuban revolutionaries. Predictably, the pair soon run into trouble, both at the hands of the Guardia Civil and in particular one officer, Lionel Tavalera, and with an American planter, Roland Boudreaux. 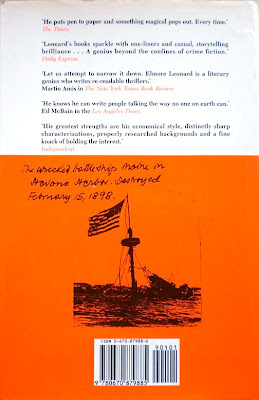 Meanwhile, in Havana harbour, seagoing marine Virgil Webster embarks on his own parallel adventure, as the ship he's aboard, the USS Maine, is sunk following an explosion – an event which will propel America into conflict with Spain. 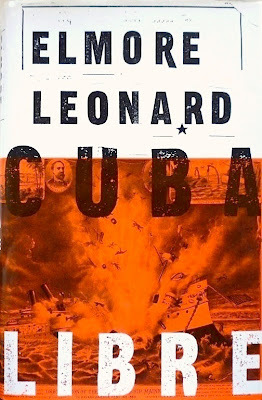 Leonard weaves fact into fiction throughout Cuba Libre, blurring the lines between the two to suit his purposes. 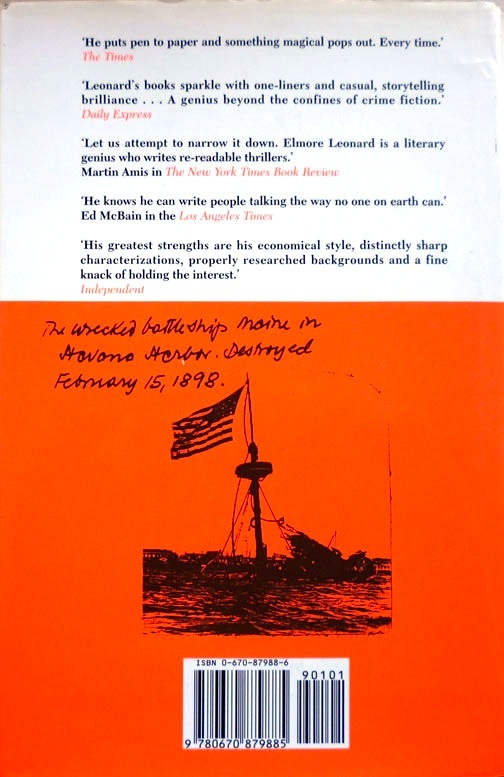 For example, although the Maine did indeed sink off the coast of Havana in 1898 with the loss of 266 lives, it seems at least as likely that it was caused by the spontaneous combustion of the ship's coal bunker than by, as Leonard suggests, a Spanish mine. But the author uses the disaster to shape Virgil Webster's story: suspecting he knows the truth, the Spanish authorities throw him in jail, in the process flinging him into the path of Ben Tyler. For Leonard, characters are always paramount; rather than slavishly recount the major engagements of the war and the revolution, in his hands the upheaval becomes a backdrop to the self-serving agendas and shifting allegiances of Tyler, Webster, Tavalera and Boudreaux, as well as Boudreaux's mistress, Amelia Brown, and Cuban wrangler Victor Fuentes – not all of whom, buffeted as they are by the events unfolding around them, will make it out alive. Mind you, I've yet to read an Elmore Leonard book where there isn't at least one death, and usually more than one – and so it is here (there's a particularly shocking and unexpected killing a third of the way in). And with a fair smattering of duels and gunfights, prison escapes and horseback pursuits, ambushes, double-crosses and the tantalising prospect of stolen loot, despite the historical trappings the novel stands revealed as what it truly is: a western, plain and simple. A couple of asides before we move on to the next Elmore Leonard novel. Courtesy of a September 1996 New Yorker article by Alec Wilkinson (kindly sent to me by Book Glutton; I'm not a New Yorker subscriber), I learned that much of Leonard's research for Cuba Libre came from one book: Our Islands and Their People, Volume I (1899), a copy of which was found by Leonard's researcher, Gregg Sutter (who these days also runs the official Elmore Leonard website), in a used bookstore on the way to see the author to discuss the novel. (When he saw the book, Leonard – who at that point was only nine pages into Cuba Libre and was having trouble with the dialogue of the period – reportedly exclaimed, "Oh, my God! Oh! Look at this!" then added: "This book, I can't believe it. A picture book of the period. This is all I need... I can get everything I need out of this." To which a despondent Sutter replied, "Don't say that. That's the last thing I want to hear.") And in yet another example of the interrelated nature of Leonard's characters across his canon, Virgil Webster is later revealed as having had a son – lawman Carl Webster, star of The Hot Kid, Comfort to the Enemy (2006) and Up in Honey's Room (2007), the latter of which also boasts an appearance by Virgil.